I am doing my MBA right now and I am looking forward to do my summer intership with any Airline here in India. Can someone guide me as to how to go about it? Dont expect much chance of any payment in these troubled times and dont expect anything worthwhile in terms of projects in sensitive departments like commerical or finance! Same goes for reservation systems where you will have very limited if any access at all. However there should be market survery/resarch jobs available esp if you are willing to do it gratis!!! That said - a word of advice!! If you get a market survey job, do it sincerely - it is the quality and not quantity which matters! Suspect data (which is unfortunately all too frequent in many of the casual surveys) is not only easy to spot out but also will ruin it for others! following you!!! To start with, you may strart inquiring with the HR departments of the major airlines asking abiout the possibilty of doing s summer internship! Thanks for your reply. Payment is not a priority for me actually, experience is. If i can get any experience, i might be able to actually market myself in this industry, if you get what i mean. Thanks for your advice and I will try and contact their HR. You have the right attitude. By the way dont get disheartened even if you dont get in as a summer intern esp in these times! Keep your interest alive and there is no substitute to learning . Read, Read, Read! Ofcourse you should also know especially in the internet what to digest and what to throw out in the garbage can!. This you will soon learn from experience. What you should be thankful for is the internet!.I grew up in the age of pre-internet era and still remember the number of times I had to beg and plead with people for old copies of - an airline time table! Now things have changed a lot. Lot of information is available in the web and you can do a lot of practical analysis with that which will also help you pitch for a good job. The quality of secondary data, while still nowhere near that of Europe or US has improved a lot in India. And if you have not got hold of a copy yet, get hold of "Flying Off Course - The Economics of International Airlines" by Rigas Doganis!.Worth every penny- althoug a little technical. But then you want to become airline manager - dont you?? Good luck - and PM me for any further queries. You have the right attitude. By the way dont get disheartened even if you dont get in as a summer intern esp in these times! Keep your interest alive and there is no substitute to learning . .
Why not also try with the biggies, like Airbus and Boeing? Btw, currently applying myself to the Toulouse Business School for the Aviation MBA. So lets see, but if your interested in Airbus, let me know, i can get you in touch with a few people who can guide you. They are marketing guys in the industry. I also agree witht he unpaid internships, its the experience that counts, and most companies will be much more liberal to accept you if you say you dont need to be paid. Thank you all for the valuable inputs. It has really helped me a lot. 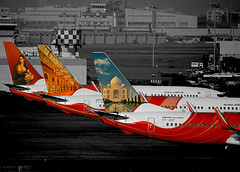 @ Nitin, i would love to be associated with Airbus. can you please help me out? Thanks Karan for giving me insights into who i should contact for which market. Infact this can be a resource that anyone can use apart from me. and Thanks a lot TKMCE for your amazing post. Your post is invaluable to me. I'am also studying MBA.This is my second year.I'am looking for jobs either in HR or Marketing stream in aviation sector.Whether it is in Airline or aircraft manufactureres it won't matter.To start of with I'am basically keen on gaining experience more than salary part. I would be greatful to anyone of you who can guide me through, as to hw to go about it,providing contacts of those whom you might know in an airline company. @Nitin,I'am certainly keen in working in Airbus and preferably in marketing department.So if you can help me on this,I would be thankful to you. PM Avbuff. He should be able to guide you.